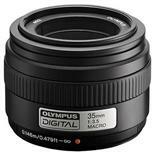 The ZUIKO DIGITAL 35mm 1:3.5 Macro lens offers an equivalent range of 70mm on a 35mm film camera. This is a special macro photography lens designed for use with the Macro flash system but also equally good in normal use. There is no need for any extensions to get 1:1 (life-size) magnification, and its compact size means you can bring it along always to enjoy taking close-up pictures in your daily scenes, such as, flowers and insects. It is also useful as a standard lens for landscape, snap shots and portrait photography.